Its kite season in India again!! Few things can make your mind soar like the sight of a kite flying proudly up in the bright blue sky. 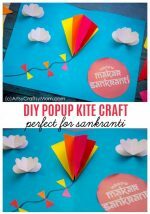 Kites feature predominantly during Makar Sankranti in several parts of India. This is to encourage people to come outdoors and get some sun, after staying cooped up indoors all winter. Whatever the reason, we know that kids don’t need a reason to go kite flying! 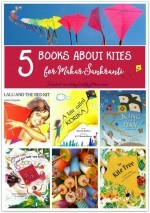 But if for some reason, you can’t fly your kite outside, you can still have your very own kite celebration at home! 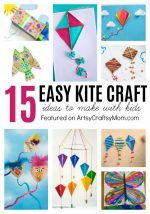 And to this end, we have an all-new craft for you – a DIY Kite Mobile! This is a super-easy craft that young kids can do on their own, while preschoolers can do with a little assistance. And don’t worry about visiting a craft store; you need very basic supplies for this craft. 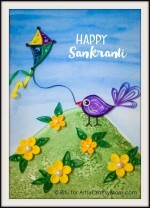 Cut out kite shapes – 4 from each sheet of paper. Make sure they’re identical or they’ll not be neat. Repeat for each color so that you have 4 x 7 kite pieces as shown in the image above. Place one kite shape down and cover with glue. Place one end of st the ing on the top part of the kite and one end of the ribbon on the bottom end as shown in the picture. Put some more glue on the ribbon and string, and stick on the other kite shape, ensuring that the edges line up neatly. Repeat with the remaining kites. Now your kites are ready. 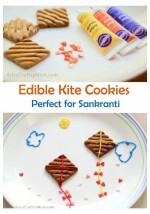 Add beads or bells at the ends so that the kites are weighed down and can make some noise. Your kites are ready to be strung. Tie each string in varying lengths around a metal hoop. Adjust the length of the kite string – don’t worry about the kites being at the same height, imperfection makes it beautiful! Make a big knot in front and cut out the excess string. Your Kite Mobile is ready!! Find a nice sunny spot with a light breeze, so that you can see your kite tails flutter. 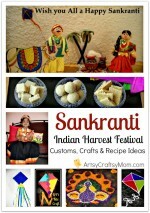 This is a great craft to do with kids – takes up very little time, effort and supplies. Do try it out and let us know how your child liked it! !